Bryan Hill pumps the brakes a little in the follow up to the fast-paced debut of 'Bonehead' with more great world building. The mystery surrounding Bonehead 56 deepens but we at least get some backstory and details about what his arrival means for a pair of brothers with opposing viewpoints. After a thrilling video game-like first issue, issue two gives way to the brothers Kray. Aleph is a tech scientist examining the unconscious "56" and marveling at his abilities. He reminds him when his brother Hideki roamed the city as the vigilante Blackdeath. Hideki is a Gladiator (cop) now and he questions Aleph's methods with 56 and its legalities. Nonetheless, they need 56 to be free on the streets for now so they can monitor him. The brothers certainly have a conflict of opinion as Aleph yearns for the days when Hideki helped to clean up the streets as a Bonehead but he's not having any of that talk now that he adheres to the laws of the land. How long before that changes? Hill sets up some interesting plot points as the mysterious 56 draws interest from others as well. The players begin to emerge in this cyberpunk world where gangs and opposing vigilante groups fight for control of the streets. 56's skills have so far impressed many including Pumpkinjuice who tries to keep up with him as he tries to speak with the muted stranger. The issue brings up more questions than answers but there's enough meat in the story to keep a reader glued to every page. Especially, with the clean and kinetic artwork from Rhoald Marcellius and Sakti Yuwono. Marcellius lets the characters command a page with their presence, drawing larger than life figures like Hideki in his Gladiator uniform, 56 on the examination table, and another one we meet at the end. In between those panels are a wonderful series of chase scenes that capture the effortless ability to jump between buildings of 56 and other Boneheads. Along with the sequencing of those panels that mimic speed, Yuwono's colors are bold and distinctive, giving each Bonehead a sort of character-specific color-scheme. 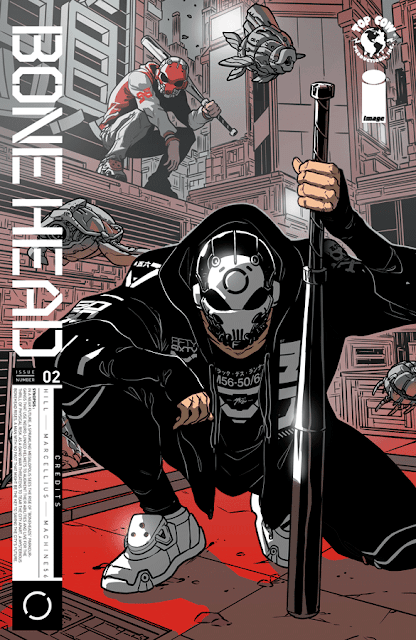 'Bonehead' #2 gets to some of the details of this new cyberpunk world without giving away too much about Bonehead 56. There's still enough mystery and action to draw the reader while marveling at the amazing art. Hill has us hooked already with emerging characters and a setting that demands to be explored. The stage is set for factions to clash, forcing certain individuals to revisit their past, and reveal 56's identity. Suffice it to say, 'Bonehead' is addictive reading.